It isn’t easy. It’s with the best of intentions that many of us begin the new year with an ambitious list of our New Year resolutions. And many of us struggle to reach even the end of January without backsliding into our old bad habits. 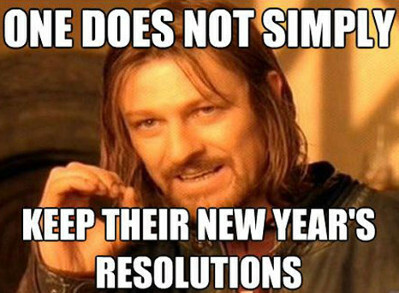 Is there anything that can be done to help prevent you giving up on our resolutions? The answer, thankfully, is yes, so read on to learn more about how you can improve yourself this year! Willpower isn’t necessarily something you either have or don’t. In fact, the more you get used to practicing exerting willpower on a daily basis, the more adept you will become at resisting the temptations of unhealthy eating and other bad habits. Remember to build up your self-control slowly at first – setting yourself incredibly demanding new years resolutions can increase the chance of failure as your willpower becomes overworked. If you’ve created a huge list of new year’s resolutions that you plan to adhere to, it might actually be worth trimming the list down a bit. Changing aspects of your lifestyle such as diet can involve a lot of micro changes based on your habits – everything from where you shop for groceries to where you go for lunch at work. The longer a list of resolutions, the more difficult it will be to stick to it so it’s sometimes better to focus on no more than a few changes at a time. If you are planning on attempting a major lifestyle change, it can make things easier if you break things down into achievable sub-goals. Not only can this make resolutions seem less daunting but it can help improve your willpower levels and subsequent chances of success. They say that laughter is the best medicine and in this case, ‘they’ have actually been proven to be scientifically correct. Researches performed a study where one group were showed a documentary about dolphins whilst another were shown stand-up comedy footage. The latter group then actually went on to perform significantly better in a task which involved willpower and self-control. Employing visual cues is a simple yet highly effective way to keep you motivated and on track when it comes to achieving goals. So whether you keep a picture of a slimmer you on your desk or a photo of your dream holiday destination on your fridge, setting up strategic reminders of what your resolutions are and why you are undertaking them will greatly benefit your chances of success.